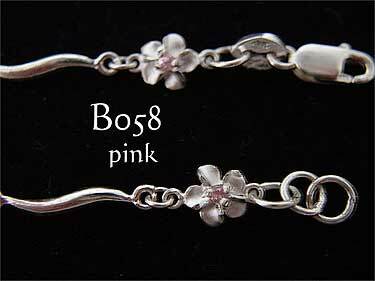 Sterling Silver Hawaiian Plumeria (frangipani) link Bracelet. Features frosted finish 6mm diameter frangipani flowers, with diamond cut petal edges, each linked by polished scrolling bars. This Hawaiian jewelry bracelet measures 7 inches, 180mm (with links to downsize by 5mm). Secured with a strong lobster clasp. Also available with flower eyes of cubic zirconia in the following colours: blue and clear.